Hi, I recently found out about this plugin, great work! My issue is that none of the Plex servers are working for me. 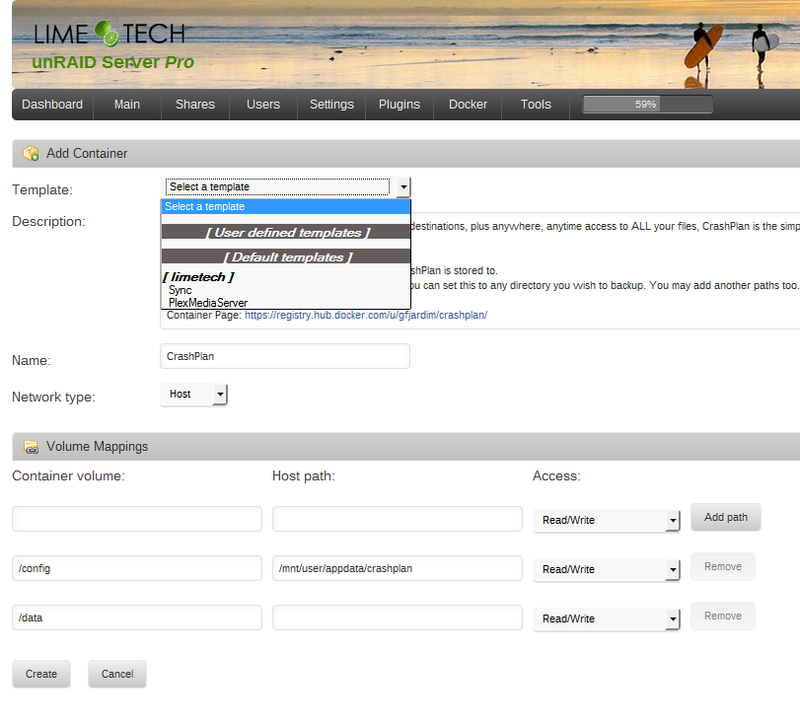 Lime-Technologies' gives me an error that I don't have access to the server. Others don't even load up the webGui... Any ideas/thoughts or suggestions of which one I should use that works? Not sure about LT's app or binhex's, but gfjardim/needos will automatically update plex to the latest version when it starts up which means it might take a bit while its downloading. This is the one I use also. If you click on the icon and select Logs instead of WebUI you can watch the progress as it installs. When the log quits updating it is probably ready. - Icon mode now default view. Sorry for the absence, but things are getting busier in my life, and I had to prioritize some projects. Took a look at the new plugin and I'm really impressed. Well done my friend! It's beautiful. Hey thanks, man. If you hadn't rewritten my original concept we wouldn't have been at this stage for another couple of months. Getting the server up and running is not the issue, is that when I try to access it, I get a "You do not have permission to access this server." I'm not sure the limetech plex is ready for primetime. I tried it shortly after 6.0.0 was released and it didn't work for me either. Have you tried needo/plex? That's the one I have been using for many months. By request, all of the discussion of the Done button has been moved to 'Done' button operation in the Development board. I was wondering how many of those commenting had actually tried out your change? It seemed a very simple and intuitive change but maybe that is just my perspective. That is not to say that a bigger discussion is not merited. Since you know what change you made in this plugin I was wondering if you could point out the detail? I was thinking of looking at whether a similar change could be manually 'patched' into the generic support libraries so I could see what it felt like on other screens. That is assuming it could be done at the generic level and will not need change in every screen? Bonienl's dynamix code tends to handle to majority (if not all) of the plugins and core OS components. Initially, I noticed that dynamix no longer included the unapplied changes message at the bottom of the screen (which I absolutely hated the positioning of, but liked the message.) So I already had a function that was called every time a dropdown changed that brought up the unapplied changes message (next to the apply button). After seeing your (and RobJ) comments about the Cancel / Done button it was a simple one line added into the unapplied changes function to change the name of the Done button to be cancel. Ultimately however what I've done is basically a "patch" on dynamix for this plugin. The dynamix code has the ability to manage this all automatically for every plugin out there (include core OS) So now its a bit of a pain for me because now with future updates to the OS I have to undo my changes to see if the dynamix code handles it. I asked RobJ to split the thread because it was 3 pages (all OT), and since I started the conversation (and was a little bit surprised at the number of responses) I felt I had the right, and that it was deserving of its own thread to further debate this seemingly minor change. That being said, I highly encourage anyone to try out the settings section of this plugin, see how they feel about the operation of the Done / Cancel button (With such a small number of settings I don't see the point of adding a "Default" button or a "Reset" Button (which I totally disagree with Tom's assessment of its operation) and post their thoughts on it here: http://lime-technology.com/forum/index.php?topic=40850.0 since this potential change will affect all users of unRaid. And congrats to both you and RobJ. Your little debate about the wiki which was almost TLDR convinced me (who isn't tied down by LT rules on changes) to make a little change which started all of this. Glad to hear that our rambling did not (quite) make you miss this issue. Now to convince Limetech that it is worth including in the mainline release. It might be worth suggesting as a change for a beta release followed by a poll to get feedback? I thought it was a no brainer but at the moment I gather Limetech do not think so. Glad to hear that our rambling did not (quite) make you miss this issue. Now to convince Limetech that it is worth including in the mainline release. Disclaimer: I'm very new to Docker and just installed UnRaid 6.0 over the weekend. I also installed the Community Applications plugin 2015.06.21 to aid in the search & installation of new Docker containers. When I attempt to add a new container using the plugin (I'm trying Crashplan), I get taken to a new browser tab on the "Add Container" screen. The very first dropdown for "Select a Template" is what is confusing me. I don't have any user-defined templates listed, and I only see 'Sync' & "Plex Mediaserver' under the Limetech repository. What exactly should I chose here? If I'm understanding things correctly, I probably need to manually add the repository that contains the Crashplan container, but I thought that was the point of this plugin - to do some of that manual work for me? Or am I missing some other step? Again, thanks for being gentle - just getting started with Docker & this awesome plugin. Thanks for all the great work!!! Yeah you did it right. All the relevant information is already filled out. You just have to set your host paths and hit create. You should perhaps have a look at the forums and see what's said about each one in their respective support threads. I base my choice off of base image they're created from and off of support. I actually prefer dockers which do not auto-update. I don't like having it potentially auto-update on an array restart just to find out the update screwed the pooch. The moment you even attempt to score 'popularity' is when you open up an entire can of worms. You can't meaningfully use any genuine metrics that are available, downloads is meaningless if it doesn't remain installed and running, and installed is meaningless if it's not running, and just running is meaningless if you're looking for a specific application version and it's an older one. For any such popularity metric anyone can think of, it can be shown how it can be a meaningless or easily gamed. A ratings system of some sort is in the future plans. But not in the near term. There are a multitude of improvements to the entire docker system which should come first to make the system easier to use for the new users. That being said, as Brit said, the metrics could very easily be manipulated and or skewed as to make any such system meaningless. Myself, I would rather the docker authors use the tools already available to them to let users such as yourself know and understand what the differences are between similarly named containers. My feelings is that basically (except for auto updating) things like plex and sab are basically the same from one author to another. The differences are more of a "design philosophy". Which is the better way to accomplish the same thing. Reading through the threads should help you to decide which version by which author you are more comfortable dealing with. Not sure which topic that is.